has anyone actually played it? I knew about it, but haven't played it yet. I only got CK2 this August and still have plenty of vanilla content to play through. Okay so this is just cool!!! VERY COOL!! Thanks for posting this Garlik! This looks dope as hell. Downloading right away! If you don't have Crusader Kings 2 yet you can now get it for free on Steam, but the offer only lasts for a day. That's the base game without any of the DLC, so you can only play as a Christian noble, but that alone should still provide you with plenty to do. I may give it a try. 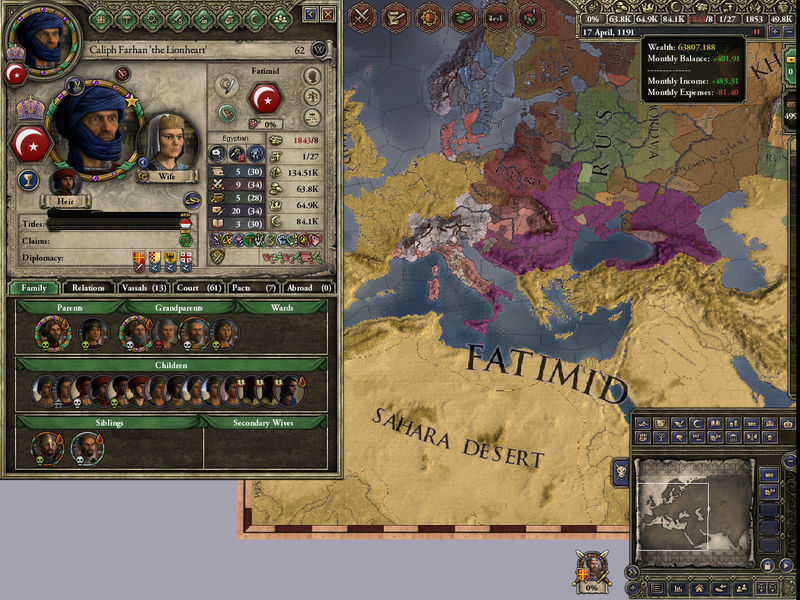 So I can't play as a pious Muslim and convert the infidels by the sword? Not without the Sword of Islam DLC. You could however play a Polish Catholic king looking for "Lebensraum" for his people in Germany. Would that work as a substitute? Alternatively you can get into a multiplayer game hosted by someone who does own the Sword of Islam DLC. Multiplayer games use the host's DLC for everyone, so while everyone needs a copy of the game only the host needs the DLC. The exception are the various portrait packs and other cosmetic DLC, which everybody uses their own. That's true. At first look combat looks really complex and deep, but once you actually learn how it works you find out that it's shallow and nonsensical and for all the complexity it fails to produce much actual depth. I made a mod for it. Combat still isn't actually good, but at least adding a small amount of heavy cavalry to an army of heavy infantry won't decrease combat performance. Reslavinization of the grounds to the Elbe feels good. 20 more minutes to get the game for anyone who hasn't done so yet. When you press the mass execution button without thinking and get this. And it all happened on Christmas eve. 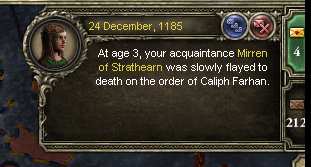 Who on Earth is Caliph Farhan? You know he is a level 99 Muslim because his turban has fused with his beard. That's the headgear worn by the grandmaster of the assassins. Very useful society to be part of. Helps me get past the issue of truces by making it easier to murder the person I have a truce with. Then I can freely attack the successor without dishonoring myself. I take it, the court ran out soon afterwards? Running out was not their decision to make. The gates were shut and they were not going to open until I said so. And if you mean running out of courtiers that wasn't a problem either. My court got overcrowded after I revoke all the titles in my empire and got all the local courtiers as well. Thankfully their numbers have thinned out over time and when I revoke titles from Christians the courtiers don't join my court. I thought that since I conquered the entire world I'd have nothing left to do and would just zoom by through the last century. Why wasen't you a pious Muslim!? Allah is punishing you! Yo, how to play this game? I mean, how the game is played? You get a leader right, and he/she has attributes - what are they for? Do you get to see the battles, Total War style? 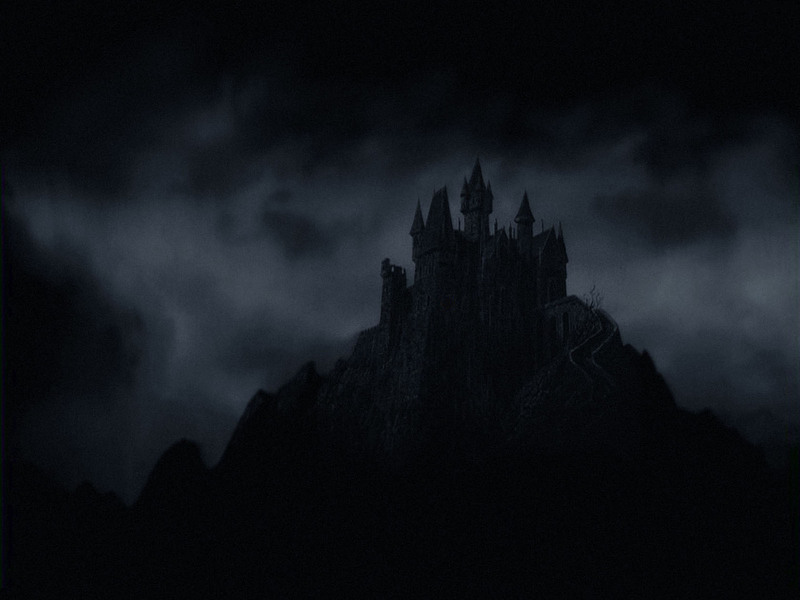 You play as a noble family House. Every family house has a leader that you directly control. When he dies, the heir assumes. If you have no heir and your leader dies, you lose the game. Battles honestly just boil down to who has the biggest number. You cannot control battles. Which is atrocious since there are countless times in history where a smaller army defeated a significantly bigger one using better tactics. If you want to know how to play the game, have this tiny 22-video series on the introduction of the game. 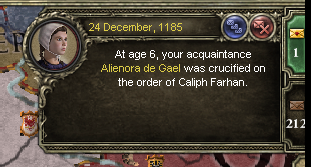 I was pious enough, it was my son who turned decadent. I invoked takfir against him and threw him in the dungeon, but because I literally control the entire map that still shot my decadence up from 0% to 100% at the end of the month. Anyway I managed to solve the crisis. 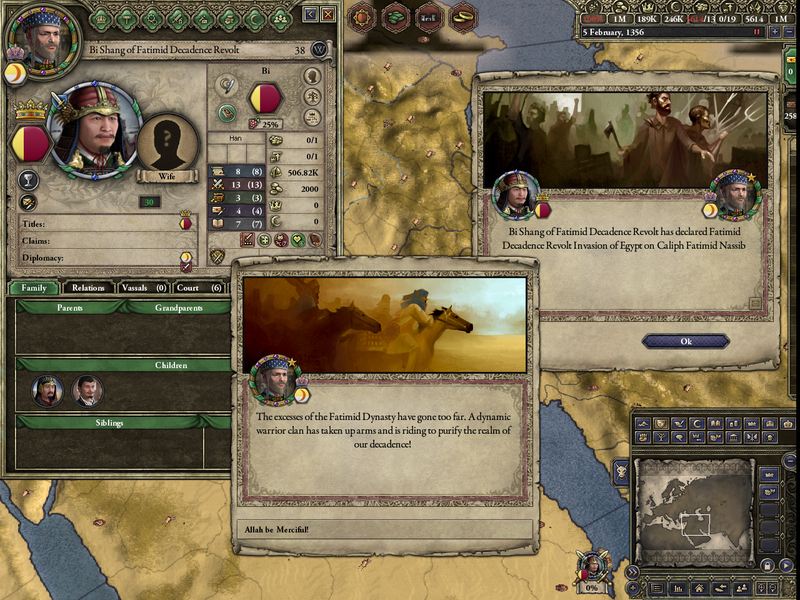 I bribed sent a gift the Jewish spymaster of the revolt and he became willing to help me murder the revolt leader and his two sons. Well, actually the entire court of the revolt was willing to co-operate in the murders. Once the leaders were dead the army disintegrated and I could go back to studying astronomy. I learned by starting up the learning scenario and reading all the hints. And then a lot of trial and error after that. But the trial and error was part of the fun. The most important thing to understand is that this game may look like a strategy game, but it's really more of an RPG in disguise. The usual strategic elements such as economy, army building, and battles are very simplistic, but there is depth in the claim system and succession mechanics. The second most important thing to understand is that you play a person (or rather a succession of people from the same family), not a country. You're not France, you're the king of France. You might get deposed and become reduced to a count of some backwater shithole while a former vassal becomes the new king of France. And then maybe your dynasty will eventually claw it's way back to the throne. But all the while you're playing the leader of a family. Kingdoms and duchies are treated as personal possessions. Along with that comes the "everything is personal" rule. After a war when a truce is made that truce is between two characters. As soon as one dies the truce ends. That guy that you raised from a courtier to a duke will love you for it, but he won't love your son. And eventually your character will die and you will play as the son and that formerly friendly duke will suddenly become a big thorn in your side. The third thing to understand is the feudal system. The map is divided into provinces/counties, each of which can have several baronies. Multiple counties form a duchy, multiple duchies form a kingdom, and multiple kingdoms form an empire. These are the "tiers" of nobility. Barons are the lowest and unplayable. Human players must be at least counts. Dukes are above counts, kings are above dukes, and emperors are above kings. At each tier you can have vassals who are of a lower tier than you and you yourself can be either independent or you can be a vassal to a higher noble. You progress to a higher tier by either inheriting a title of that tier or by conquering enough land and spending gold and piety to create a title of that tier (if it doesn't exist yet). Vassals are you supposed underlings, but they are really a bunch of scheming bastards who are just waiting for you to show some sign of weakness. Never trust them, especially if they have the Ambitious trait. They are still obliged to provide you with a portion of their troops and depending on your laws also a portion of their income. And to answer what you actually asked, stats are less important than they seem, but Diplomacy makes people like you better, Martial increases the size of your army and makes you better at leading armies, Stewardship gives you more income and demesne size (how many castles you can own before you get penalties), Intrigue help you murder and not get murdered, and Learning increases how quickly you gain technology points. Ireland is a good place to start and experiment a little until you figure out the UI and basic gameplay, but it's kind of boring and uneventful. Once you get the basics I would recommend starting a new game somewhere more interesting. Do not play a leader of a big realm like the Holy roman Empire though. You'll get overwhelmed. Play a duke or small king instead.